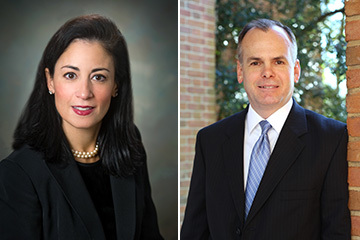 Samford University has announced two major administrative changes in marketing and development. The appointments were announced Jan. 6. Betsy Bugg Holloway, Samford’s chief marketing officer since 2013, has been promoted to vice president for marketing and communication. Douglas Wilson, Samford’s executive director of development since 2008, has been promoted to assistant vice president for development. Holloway came to Samford in 2002 to serve on the faculty of Samford’s Brock School of Business after several years in international marketing. Holloway recently was elected president of the Rotary Club of Birmingham and is a former national president of Omicron Delta Kappa national leadership honor society, which operates on more than 300 college and university campuses around the country. She also serves on several boards locally and regionally. She earned her Bachelor of Arts degree from Vanderbilt University, a Master of Business Administration degree from Samford and a doctorate in marketing from the University of Alabama. W. Randy Pittman, Samford’s vice president for advancement, said Wilson’s promotion also comes at a pivotal time for the university. Wilson will continue to coordinate the work of major gift officers across the university and will take on the primary leadership role for the university’s next fundraising campaign. He was heavily involved in Samford’s recently completed $202 million campaign, the largest in the university’s history. A 1983 Samford graduate, Wilson has served as a Samford development officer since 2000. He served as an officer in the U.S. Air Force, and is active in his church and the community. He is a member of the Association of Fundraising Professionals.